Are you ready for the scorching sun of the beautiful African savannah land? Well, Stellar Jackpot Serengeti Lions is an exciting slot game developed by the famous Lightning Box Games company. The latter has made a good reputation for supplying high-quality slots with stunning graphics and visual animations, excellent sound effects, and a wide range of features and symbols. All these attributes are crystal clear in this five reeled, four rows, and 40 possible ways to win slot game. Although this is not the first online slot with an African wilderness theme, the developer has not only used the latest cutting-edge technology but also, creativity to make it stand out from the others. Besides the appealing outlook, Stellar Jackpot Serengeti Lions video slot is packed with special features and symbols such as space shuttles, diamond, free spins to increase your chances of hitting the jackpot. Join us, in our adventure across the fascinating African land. 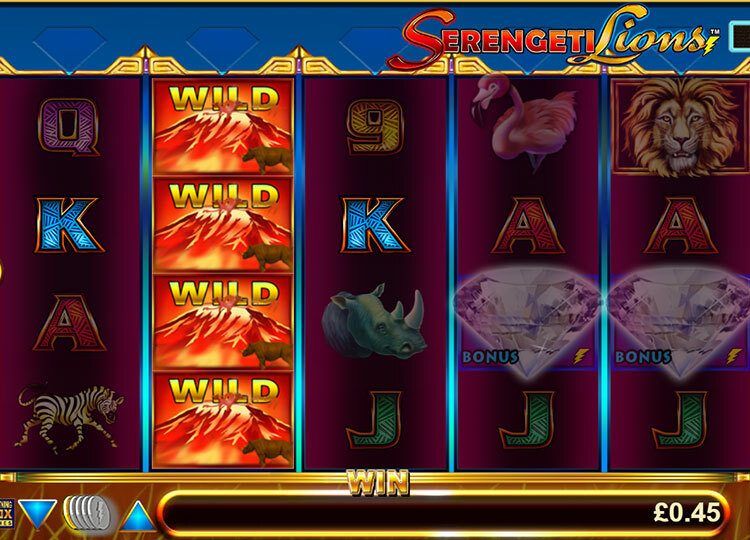 Stellar Jackpot with Serengeti Lions slot tells a story of an adventure in the magnificent savannah land. The interface is sleek with wild animals and birds as the main characters. You will be accompanied by immersive background music that is composed of traditional drum beats, local musical instruments like a tambourine, shakers, and the chirping of birds, as you aim for the three different types of jackpots. The game is presented in vibrant yellow savannah colors to emphasize the theme. Playing Stella Jackpot with Serengeti Lions is simple and straightforward since it is played across four rows, five reels, and 40 fixed winlines. It is important to note a few things before you get started. First, all the payouts are made by the game pay table. Second, the payline wins and scatter wins are multiplied by the bet, and all wins must start from the leftmost reel towards the right on the adjacent reels including the scatter wins. Third, malfunction voids all pays and plays in the slot. Before you dive into exploring the African landscapes, it is essential to set your bet. There are several betting options to help you in adjusting the game to your preference. You will be able to monitor all your account transaction from the top menu bar on the game screen which includes, principal account balance, the Total Bet, and the amount won. The top right-hand side corner has three options showing the amount earned in different jackpots. The bottom left corner has three betting option, Bet Down, Max Bet, and Bet Up. Clicking on the settings icon will lead you to a page with different categories such as coin size, autoplay spins, sound option, and the game pay table. Click to play once you have confirmed that everything is to your liking. 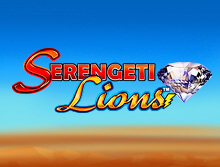 Unlike other online slots that are crowded with features, Stellar Jackpot with Serengeti Lions comes with three main elements; the scatter symbol and the wild symbol. Other symbols in the slot are represented by favorite wild animals like the Zebra, Rhino, Elephant, and the Lion. There are also low paying symbols which are marked by the traditional standard card letter like A, K, Q, J, 9, and A. These symbols have different payouts depending on the winning combination. This feature allows players to win up to 10 free games with all the wins multiplied by up to eight times the Diamond Pick Bonus. The Diamonds come with up to five, eight or ten free games plus a 3x, 5x, and 8x multiplier feature. After making your choice, you will be given the opportunity to Swap either, or both the free games and the multiplier wins. The free game will start after swapping or accepting multiplier and free game option. The Hold N Spin is a simple feature that will increase your chances of initiating the Diamond Pick Bonus. Landing any 2, 3, or 4 of a kind will trigger 2, 3, or 4 Diamonds respectively. The rest of the reels must be played up to three times or until the Diamond is activated. The Stellar Jackpot will be activated when three spaceships show up in the game. You need to remember that the jackpot prizes are fixed and non-progressive, and they cannot be multiplied by the multi-bit. The bonuses available have six challenge level and a jackpot level. With the higher multiplier bets, you will increase your chances of hitting the jackpot prize. Three Blue Major symbols award the Major jackpot, three purple Minor symbols awards the Minor Jackpot, and three Green Mini symbols award the Mini jackpot. It would have been a big shame to Lightning Box Games to design such a thrilling video slot without its mobile version. The game is fully optimized using the latest technology like HTML5 which enables it to fit on small screen devices like mobile phones and tablets. Stellar Jackpots with Serengeti Lions is available in instant play across all devices, meaning, there is no need to worry about downloading software. With a medium variance and theoretical return to player of 97.01%, Stellar Jackpot with Serengeti Lions is the best online slot there is. The game is not only visually appealing and immersive but allows players to win up to three different jackpots. Lightning Box Games have used unique symbols, and features that have not been witnessed in any other African Savannah themed video slot. The background music is perfect and the graphics and animations superb.